With 2017 just around the corner, I may be one of the only runners without a definitive race schedule for next year. The reason I don't have a schedule (yet) is that I am waiting anxiously to hear the results of the Leadville Trail 100-Mile Run lottery. The lottery results will be shared in mid-January. For some reason, I have never been more nervous about my chances of getting drawn in the Leadville lottery! I simply don't know if I'm getting in, even with five big buckle finishes. 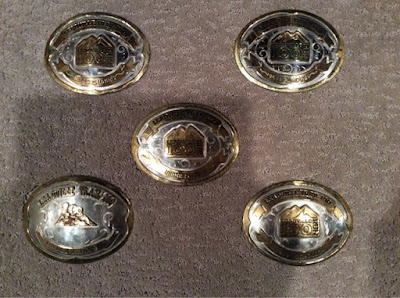 Given that I have made the commitment to earning the 1,000-mile buckle (I am halfway there! ), my hope--my wish--is that my name will be pulled from the hat and that I'll be among the lucky folks lining up at 6th and Harrison at 4am next August 19 for 100 miles of fun. Because--well--there is no place I'd rather be in that moment in time. No place. Not to go on a tangent, but Leadville is such a unique experience. I have never run a race like it. The energy, the holy-sh%t factor...just epic. That's why I keep coming back. Leadville has become not just what I do every August; it's become who I am. When I am not in business attire, you can find me wearing one of my Leadville shirts and always my black Leadville hat. It's my identity. So, if all goes to plan, I will get into the 2017 race and earn that 1,000-mile buckle in 2121, when my son is 13 years-old and able to pace me from Mayqueen to the finish. And when we cross the line together, my hope is that the gift of this race will pass from me to him (unless I decide to gun for the 2,000-mile buckle!). It'll be his if he wants it. Yeah, a Leadville summer it'll be. And if I don't get drawn in the Leadville lotto, it'll be decision time. I would have two options to consider. 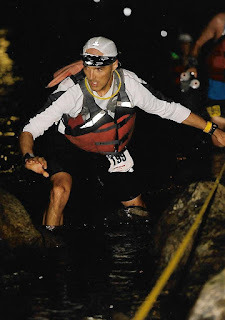 The first would be to sign up for another 100 in the summer and then build out a race schedule that prepares me for whatever 100 that may be...a return to Mohican? Revenge on Bighorn (if Bighorn is even open then)? Run Rabbit Run? Who knows? The second would be to go to Austin in April and try to grab a slot for the Leadville 100 at the Rattler. This option would be far from ideal and, honestly, I would probably not do it because I don't want that many unknowns surrounding a sport that is supposed to bring me happiness. So, if I don't get into Leadville, I'll likely be looking for another 100 in 2017. So, here's to hoping I get into "the Race Across the Sky," lottery gods willing! Lately, I've been reflecting a lot on my experience at the Western States 100-Mile Endurance Run earlier this year. I am still a bit astonished I had the potentially once-in-a-lifetime opportunity to run that legendary race. With the passage of time, the rugged experience from Squaw Valley Ski Resort to Auburn, California has become that much more special to me. With reflection, my disappointing 26-hour finishing time stings just a bit less. The narrative from that race has changed from a disappointing bronze buckle to a hard-fought, gut-testing finish in the greatest ultramarathon on Earth. The fact is that I got a chance to run Western States, and I finished it. If I'm lucky, I'll get one more chance to run it in my lifetime (my friend of 36 years, Matt Curtis, just got his second ticket back to Squaw). 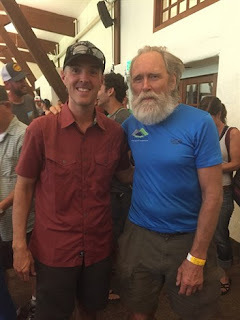 With Western States founder Gordy Ainsleigh at the pre-race meeting. For me, the crux of the race came down to the canyons, that notorious middle-third of the course where the mercury hits truly epic levels. Coming into the appropriately named Last Chance aid station (mile 43), we were warned about the high heat in the canyons ahead, especially Deadwood Canyon. "It's 110 down there...be ready," a volunteer said. Was I scared? A little, yeah. Over the years, I've read a lot of stories about depleted, emotionally and physically broken runners ending their races at Devil's Thumb (mile 47), which is atop Deadwood Canyon on the other side of that inferno. So, leaving Last Chance, I made sure I had plenty of ice in my Buff and in my hat and lots of cold water to sip on (they have lots of ice at Western States!). Karl Hoagland, publisher of UltraRunning Magazine, left Last Chance at the same time as I did, saying to me, "24 hours is going to be close." Karl had run this race many times, and I so I knew that from here on out every second counted. Game on! The drop into Deadwood was incredibly steep. That famous scene from "Unbreakable," when Kilian Jornet rips past Geoff Roes and Anton Krupicka going down into Deadwood, does the canyon's steepness no justice. It is an insanely steep drop, much of it covered with leaves. When the day comes that I return to Western States, I will be ready for the drop into Deadwood. Man, was it steep...and hot...and dusty. When finally I got to the bottom of the canyon and crossed the American River by bridge, I saw two guys wading in the water. I remembered then what a race veteran had told me a few days prior. "When you get to the bottom of Deadwood," he implored, "get in the river. It will save your race," the reason being that the cold American River water will lower your core body temperature, which in turn will do your gut a big favor. With my Buff still a bit icy, I kept moving, skipping the opportunity to cool off in the river. I felt fine! This would turn out to be the single biggest mistake I made--and it would cost me. Feeling physically okay, I started the viciously steep climb out of Deadwood Canyon and up to Devil's Thumb--a climb that nearly destroyed me. I have done some steep ones in my day--Jemez in 2011, the backside of Hope Pass at Leadville quite a few times (to put it mildly)--but that climb out of Deadwood was in a league of its own, and I think it was not because of the sheer vertical but because my body temp started to rise. Coming into the Devil's Thumb aid station, I was sweating profusely. My shorts were soaked all the way through. I had never sweated so hard in my life! And my stomach was starting to go south, probably due to overheating. Damnit! I should have gotten in the river! But it was too late for that. Now in the Devil's Thumb tent, I sat down and immediately had a handful of volunteers attending to me like I was an Indy car driver in a pit stop (this is the Western States way). At Devil's Thumb, it was easily over 100 degrees and yet there I sat, shaking like a leaf and wrapped in a thick blanket! I couldn't control myself. They handed me some soup and I spilled it everywhere because I shook so badly. Then came the vomiting after I had some broth. Concerned, they asked if I had crew on the course and I said I did...my wife and son, my mom and dad, and a few buddies, Mike and Kenny, who would be pacing me after Foresthill. Thinking about my wife and son, I started to choke up. I felt as if my race was crumbling. After checking my vitals, the aid station crew felt I could continue but instructed me to avoid taking any salt capsules. They thought maybe I'd taken in too many S!Caps. I needed salt, they said, but not that much. I heeded their advice and left with lots of water and a handful of salty snacks (which they gave me) that I could barely get down. Incredibly, I rallied just a bit after Devil's Thumb and started running, making my way down into El Dorado Canyon, which was again very hot but not quite as hot as Deadwood Canyon. There's an aid station at the bottom of El Dorado Canyon and I stopped at it briefly but could barely get any calories in me. So I started the long climb up to Michigan Bluff, which sits at mile 55. There, I would finally see my family. The carnage going up to Michigan Bluff was pretty epic. I saw a number of runners in distress, and I felt like I was among them...depleted to the core. All I wanted was to lay down and take a nap--a clear indicator of heat exhaustion. One foot in front of the other...... Finally, coming into Michigan Bluff after what felt like a never-ending climb, I saw my wife and son. I teared up a bit and said to my wife, "I'm having a tough race." When I saw the aid station, I immediately went for the cot and laid down--a first for me. My stomach was in horrid shape and I need to close my eyes and push the "reset" button. So I laid down and asked the staff to let me nap for 10 minutes, which they did. My wife and son were allowed into the tent with me, while my parents looked on, concerned, from behind the barrier separating the runners from the spectators. When I woke up 10 minutes later, my stomach turned south and once again I started vomiting. It was an ugly site. The Ginger Runner actually mentioned how horribly sick I was in his interview with Brian Morrison not long after Western States. I was so sick. It was at about this time that a friend of mine had gotten ATV'd into Michigan Bluff with kidney issues. His race was over. Was mine over, too? I didn't know. Laying there in the cot, I didn't know what to do. I was sicker than hell and had 45 miles in front of me. Then, out of no where, I saw this huge man walk under the tent and look at me. "What's going on here?" he asked the medical team. It was Gordy Ainsleigh, who founded this crazy race 40+ years ago! Gordy, a chiropractor and true living legend, asked if he could work on me for a bit, to see if he could get my stomach in a better place (he had dropped from the race earlier in the day due to, I believe, IT band issues). I said yes. So he got to work, pressing on my gut and even doing adjustments to my neck. Meanwhile, my wife and son stood there, watching. Gordy at work on yours truly at Michigan Bluff. It looks like he's choking me with my Buff but I promise he's not! After about 10 minutes, Gordy got me off the cot and walked me to the nearby food table. He told me I could--and would--finish this race, but admitted that 24 hours was probably now out of reach. I grabbed some salty snacks but he said to put them back down. Instead, he gave me some grapes and watermelon, saying I needed the sugar and water, not salty, fatty snacks. I thanked him. I even asked if he'd stand for a photo with my son, who had been wanting a picture with Gordy ever since seeing "Unbreakable." Gordy agreed, posing for a photo with my boy--a photo that I know my son will treasure one day. As I left Michigan Bluff, I felt distress in my parents. I had spent easily a half-hour in the tent and had 45 miles in front of me. My dad, walking with me out of the crew zone, got choked up. He said to me, "Let's get this thing done, OK, son?" He was emotional. I was emotional. "I will, Dad," I replied. But I was more than emotional. I was in distress. 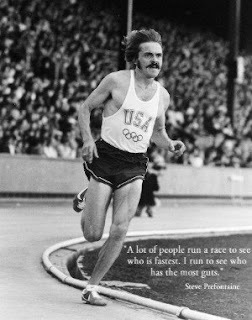 Yet I knew I had experience to deal with tough races. I knew I had more than enough endurance to cover the distance. I had the requisite toughness. I knew deep down I could finish this race no matter what it threw at me. The third canyon, the ominous-sounding Volcano Canyon, wasn't nearly as bad as the first two. No matter, it would take some time (I knew this) to come back from what Deadwood and El Dorado had done to me. And so my race in many respects hit rock bottom at Foresthill (mile 62), where I once again found myself down for the count with vomiting, chills and extraordinary fatigue. But I got out of Foresthill, mostly because my wife ordered me out ("It's time to get going, Wyatt," she said firmly), and had a very solid stretch running down to the American River with my pal, Mike. That's a 16-mile "mostly downhill" stretch that I ran quite well on. Yet the damage had been done. From the river (mile 78) to the finish was something of a death march. 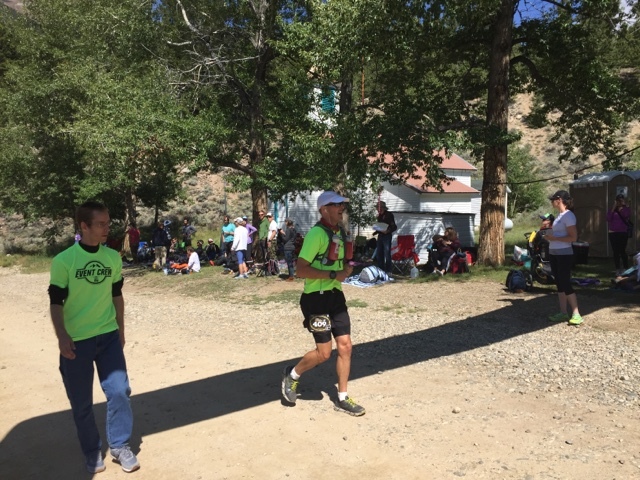 Oh, I ran a good bit of it, but I was absolutely depleted, coming into Brown's Bar (mile 90) having battled hallucinations and insanely painful chafing. So I slept at Brown's Bar for 10 minutes, hoping some shut-eye would stop the hallucinations (which it did). From there on, it was all about "staying the course," as I said repeatedly to myself and my crew. "Stay the course.... Stay the course." My Western States didn't go as planned. It was a long, long day in rugged country and on punishing trails--a day-plus that I'll never forget. The so-called "Western States Killing Machine" had done her best to grind me up into nothing, but I refused to give up. I just kept putting one foot in front of the other until I crossed that finish line with my son. And that is how I finished Western States--one step at a time. I grinded it out. If your name got pulled from the hat last Saturday, I congratulate you. You have earned a spot into a race that will change your life. If you didn't get pulled, don't give up. If you stay patient and committed, your day will come--just as it came for me. Crossing the American River, mile 78. See, I came back! I’m not sure I’ll write a blow-by-blow report from my race at the Western States 100-Mile Endurance Run. So much has already been said about this event over the years. Where could I possible add any value? As with all ultras, you will never finish unless you have a Why. 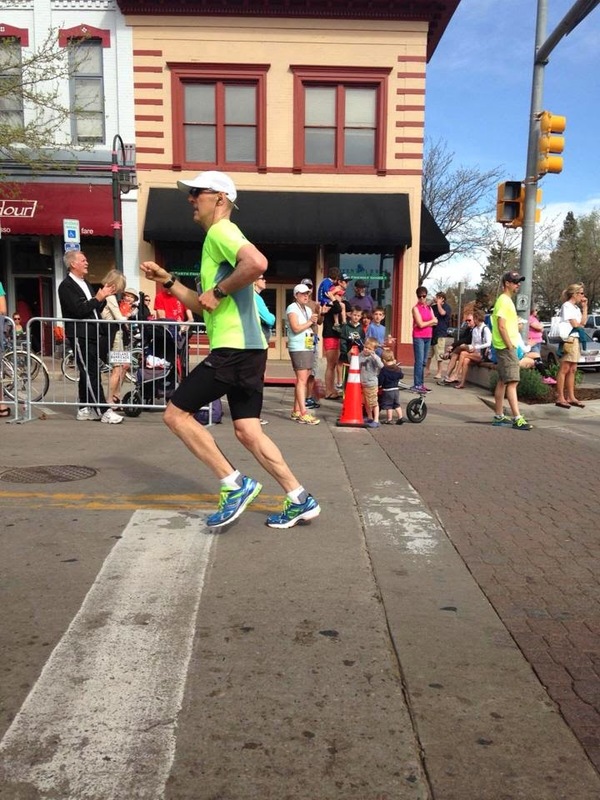 Going into the race, the big Why was simple: It’s Western States. As the race wore on and things turned south, the Why expanded to not just finishing the “big dance” but also to setting a good example for my son, honoring the training I’d done, and making this whole adventure worthwhile for my family and crew. Quitting was never an option. And so in the final 300 meters when I was running around the Placer High School track, over 26 hours into this madness (I had thought sub-24 was very realistic going into the race), I talked with my 8-year-old son, who was by my side and holding my hand. I cried. I told him that you never quit, even when you’re being kicked in the teeth repeatedly. You never give up, especially when you know perseverance and resilience will lead you to the promised land. It was a moment with him that I will never forget. He saw me suffer. He saw me fight to the finish. He saw me show kindness to my family and crew when the chips were down. He saw me incoherent at Highway 49 but nonetheless moving forward, mumbling “stay the course.” He saw others shower me with love and care, including the race founder himself, Gordy Ainsleigh, at Michigan Bluff. My hope is that one day all of this will help make him a better man. I am his father and in that race I refused to fail him and come up short in my responsibilities as a man who is obligated to mold him into the best man he can be. In that regard, it was a tremendous experience. As far as the race itself, the vibe at Squaw Valley Ski Resort (where you start) is electric. The course itself is beautiful. The first 30 miles, which feature the climb up and over the Escarpment and some gorgeous running through the Granite Chief Wilderness area, is alpine running at some of its finest. The second third features the canyons—Deadwood, El Dorado and Volcano. The third section is “mostly” downhill, featuring the fast California Street trail which takes you from Foresthill (mile 62) down to the American River Crossing (mile 78). From the river crossing, it’s mostly rolling terrain to the finish, with a few good climbs mixed in. The volunteers and aid stations are spectacular. The aid stations are well-stocked with what you need—not just food and drink but also ice, cold sponges and sprayers. The volunteers are helpful and caring. The medical staff, who I’d rather not have gotten to know (but did), are professional and compassionate. The organization of the race is phenomenal, save a few sections where course markings were a bit sparse. But, then again, I am originally from back East, where we tend to over-mark courses with pie plates, lime and billions of streamers. The sparse markings in areas, such as the long downhill stretch from Robinson Flat to Last Chance and a few turns going up to Robie Point (the latter of which could have been sabotage), never rattled me but it would have been nice to see some more confidence markers. Western States has built a big, strong community. The community puts this race on, with excellent leadership from the board and the race director, Craig Thornley. Few races have such a tight-knit community. This is what makes Western States unique, in my eyes. Looking back on it, while the result certainly wasn’t what I’d hoped—I still feel I am fully capable of finishing under 24 hours—I know I ran a smart race. I went out conservatively. At no point was I pushing beyond my limits. What seems to have done me in were the canyons and the silent killer that was heat in excess of 100 degrees (which everyone experienced, of course). I fell well short in my descent of the canyons. By the time I got to Devil’s Thumb (mile 47), I was nauseous and soon after starting vomiting—probably the product of the heat, though I’d been using ice all day long to stay cool. 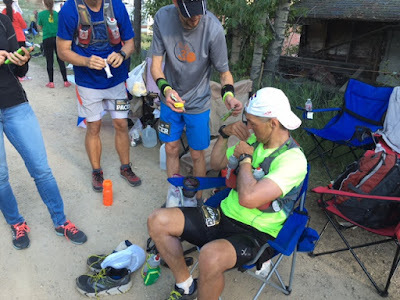 More vomiting ensued at Michigan Bluff (mile 55) and Foresthill (mile 62). In each of those three aid stations, I was laid up in a cot receiving medical attention. In the descent to the river from Foresthill, I had some good stretches and seemed to be coming back a bit. But by the time Brown’s Bar (mile 90) appeared, I was hallucinating. So I closed my eyes there for 10 minutes and then we got going again. The hallucinations abated and I mostly jogged and walked my way into the finish, seeing a second sunrise for the first time ever in a 100-miler. As far as what’s next, I don’t know. I have signed up for the Leadville 100 but I am going to give it some thought. 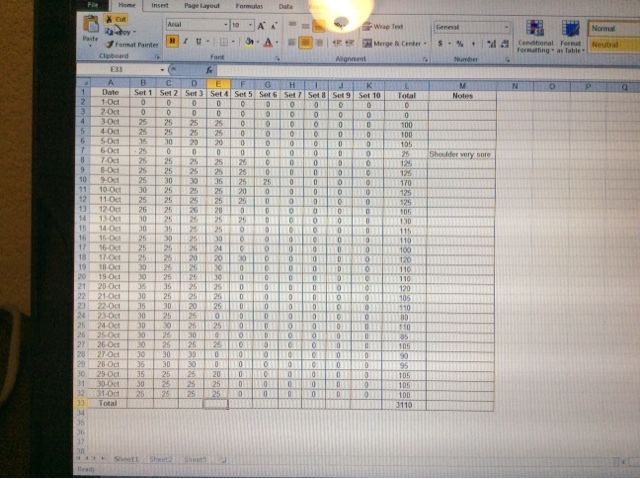 Putting myself through this process in every 100 seems absurd to me. And it takes the fun out of it. Why should I sign up for a puke-fest when instead I could race shorter distances, do fairly well and actually have fun? Running 100 miles used to be fun but in every one of them of late I go in with a great attitude only for my stomach to completely go south on me. So at this point Leadville is doubtful and that’s OK. I have finished ten 100-milers, winning one of them, and I am proud of that. Forgoing Leadville wouldn't be quitting; it would be deciding that my running has gone in a new direction. I will never quit running. In lieu of Leadville, I would instead gun for a fall marathon where I can get re-qualified for Boston. But that decision isn’t final; I definitely realize I need a cooling-off period. I am indebted to my family and crew for their support: my wife and our son, who are like my heart and soul; my mom and dad, who I’m sure struggled to see me in such shape mid-way through the race; Mike, who paced me from Foresthill to Green Gate; Kenny, who paced me from Green Gate to the finish; and Kenny’s lovely wife, Jonnie, who is a wonderful person and was there the whole way to help. A few days ago, I crunched the splits from my race at the North Fork 50K on June 4 and, boy, I sure liked what I saw. At mile 20, I was in 18th place out of a field of about 130. From miles 20-32, I ran the 4th fastest split of all the 50K field, moving up 10 places to finish 8th out of 128. The folks who ran a faster final 12 miles were the 1st (4 minutes faster), 2nd (1 minute faster), and 3rd (1 minute faster) place finishers. This is just more proof that going out conservatively usually works on most courses. By the same token, it also proves that going out too fast in a race usually backfires (which is one reason why I was able to move up so much in the last 12 miles). It all gives me confidence that this strategy will work at Western States, a race that rewards patience. If you don't exercise patience, well, the "Killing Machine" will get you at some point...usually after Foresthill. So, on race day, in the first third, I will be going out at a relaxed pace. I will do all I can to ignore the hype and instead focus on my own race. In the middle third, the goals will be to keep it relaxed and, above all else, stay cool mentally and physically, because it's going to be hot. As of now, the forecast has Foresthill at 89 degrees and Auburn at 96 degrees. The canyons will be a few degrees warmer. I will have 3-4 water bottles with me. One will be just for dousing myself with creek water and the others will be for drinking. Approaching the race in this fashion will ideally bring me into Foresthill (mile 62) with strong legs, which are what you need in the last 38 miles when the trail is so runnable and downhill. It's in these final 38 miles, as I've read it, that the carnage is epic and those who went out too fast find themselves in the pain cave and those who've shown restraint can open it up and gain ground. My only hope is that I am not among the carnage! I know that if I run a smart race, I can run well in the final 38 miles. I don't pretend that the race will go off without a hitch. Problems will arise. I may even puke a few times. I am sure I'm going to find myself quite hot at times. The key will be to stay calm and fix the problems as best as we can. But, above all else, it comes down to having fun. This is Western States. In the end, I know I trained well. Could I have done a bit more climbing? Yes. But overall I had a good training cycle and put in some good mileage for a guy who works full-time and has responsibilities as a dad and husband. Plus, by race day, I will have put in 11-12 quality sauna sessions. Speaking of sauna sessions, they are getting easier. This week I've been using the sauna at Lifetime Fitness. Their sauna tops out at 185 degrees and I've put in two half-hour sessions (this week), drinking 60 ounces of water in each. The breakthrough I have made as far as recovering from sauna session is taking an S!Cap beforehand and another S!Cap afterward. I have found that, if I do that, the next day I wake up feeling fine--no washed-out feeling, no headaches, no grogginess. Another factor in all of this is that I'm experienced. This is my twelfth hundred and I fully intend on it being my tenth finish at the distance. I have big-buckled four times at Leadville, which is not exactly an easy hundred. Also, it's not like I don't have experience in the heat. The 2007 Burning River 100 and 2008 Mohican 100 were no walk in the park. As I recall, both saw temperatures over 90 degrees (along with high humidity). I wish everyone who will be running Western States all the best. I look forward to meeting the Western States community next weekend and to running the most storied course in all of ultra. Only about 370 of us will have this opportunity and I intend to take full advantage of it, soak it all in, and be grateful. I'll try to update my blog one more time before raceday. See you in Squaw. With the Western States 100-Mile Endurance Run now only 16 days away, I'm in the throes of heat training. As most know, Western States is a very hot race, especially in the "canyons" section, and so it's key to go into the event ready to handle temps well in excess of 100 degrees. I'm coming from Colorado, where we had our signature cool spring. Unlike those coming from other areas of the country, our natural conditions until now (it's supposed to be 90 degrees today) have offered next to no opportunities for legitimate heat acclimatization. 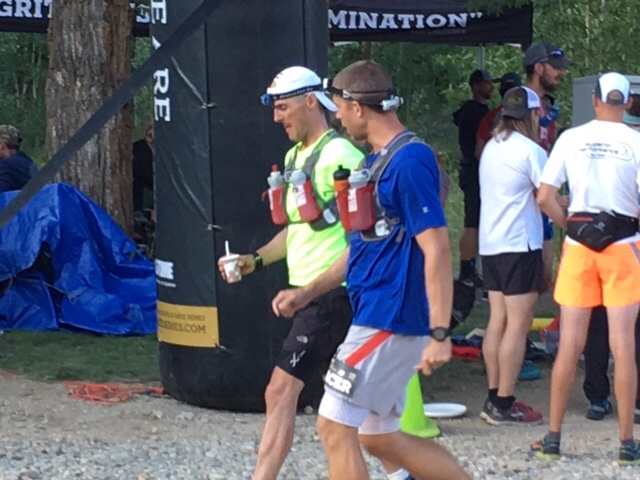 With no real experience when it comes to formal heat training, I have used this great article by Badwater Ultramarathon legend Authur Webb as a guide. I have also sought some thoughtful advice from previous Western States finishers like AJ Wellman (2015 sub-24-hour finisher), Matt Curtis (2014 Grand Slam champ) and Andy Jones-Wilkins (10-time Western States finisher). As such, my heat training has focused on sauna sessions and some maintenance activities like--dare I say--driving home from work in the afternoon with the windows rolled up and vents off (I have been parking on the upper deck to get my car as hot as possible). With the weather in Denver finally starting to warm up, it will also likely involve a few afternoon runs. But sauna sessions are the centerpiece of the strategy as they are widely considered a "best practice" for Western States training (not to sound corporate). Going into my Western States build up, while I knew sauna time would be a critical aspect, I didn't realize how physically hard it would be. The actual time in the sauna isn't what's so hard; it's how I feel the next day. More on that in a second. When I go into the sauna, it's always with about 50-60 ounces of ice-cold water in hand. And I always make a point to drink both bottles while in the hot box. I try to pace myself so that I'm drinking at an even rate for the whole time in the sauna and take that last sip just seconds before leaving. I also make a point to take an S!Cap afterward to help replace lost electrolytes, and I have found that the S!Cap does make a difference. How long am I in there? Anywhere from 28-33 minutes at this stage. I originally wanted to build up to a 40-minute session but I honestly cannot conceive of how that might make me feel the next day. Such times as 28-33 minutes in the sauna are way out of the norm when you're looking at the "general population." Having watched a lot of people come in and out of the hot box over the past few weeks (this has offered its fair share of humor, too), I can say that the average session for folks is 4-8 minutes. No one stays in the sauna for a half-hour or even close to it. People have been incredulous when they saw how much I was sweating and asked how long I'd been in the sauna. Never mind what they say when I tell them why I'm doing this. It's all way out of the norm. And so I tell myself that, yes, this should be hard...because it is hard. As an aside, despite the growth in ultrarunning over the past few years, we should never lose sight of how out of the norm it is to do what we do. It's easy to forget that fact because, for most of us, our friends are also ultrarunners. But the bottom line is that 99.99% of the population has no interest in lining up for an ultra. They cannot conceive of it. Why am I finding it so hard to sauna train? I have found that the next day I usually struggle with headaches, mild dizziness and general fogginess. Occasionally it feels like a bad hangover. Sometimes it can be draining. The mild dizziness usually clears up in a day or two but it's no fun. Having spoken with others, it seems this is all part of the process. Heat training is hard and fatiguing and that's why many Western States runners save it for the final stages. I started a week before my taper kicked in and it was hard to balance it all. So I did what I could and now am trying to get to at least 10-12 sessions by the time I'm four days from the race, when it's all behind me. While I have truly loved the build-up to Western States, the sauna training aspect has been much harder than I anticipated. I cannot imagine what Badwater heat training would call for! If you have any heat/sauna training tips, chime in! Well, just like that, the taper for the Western States 100-miler is here. May was a very strong month, and I was able to go into my 3-week taper with a huge (for me) 7-day stretch where I ran 102 miles and climbed and descended a combined 24,400 feet. May saw 370 miles (not including miscellaneous walking). Most importantly, I felt good through all the volume and still feel fresh and alive. It all ended with Saturday's North Fork "50K." I quote "50K" because it's really a 32.5-mile race--and one of the best such races in Colorado with its friendly, down-home feel, great organization and tremendous post-race picnic food complete with tall cold ones. It seems the Golden Gate Dirty Thirty, which was also on Saturday, is the "in" 50K for this time of year but I'll take North Fork any day of the week as it suits me better. It's a beautiful, fairly fast course, passing through some of the burn areas from the 1996 Buffalo Creek Fire as you climb about 4,800 feet (which is a lot less than Golden Gate). Plus, it has some nice descents that are perfect for conditioning the quads. Except for the fact that I saw a dead motorcyclist on US 285 going home, it was a great day at North Fork. I finished in 5 hours and 21 minutes, good for 8th overall out of 128 finishers. Going into North Fork, the strategy was to run it very conservatively (as in all-day pace) and essentially use the race as an aided long training run. I was able to hold to that strategy through about 21 miles, getting passed by quite a few runners, and then it fell by the wayside a bit when I "decided" to amp up the pace and see how many folks I could reel in. 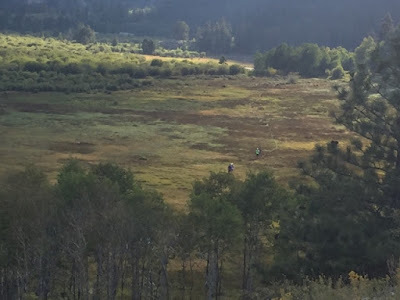 As we entered one of the burn areas in the late morning, I had a nice view of several runners in front of me. It was at about that time that my iPod turned to Bob Seger's "Shakedown," a great tune from the eighties (I've always been a Seger fan). With the competitive juices flowing and the legs suddenly alive, I picked up the pace and by mile 23 was running sub-7s, absolutely hammering the downhills. I passed, by my count, every single runner that had overtaken me in the first 20 miles and was looking for more. And I was feeling good despite the heat starting to pick up. My legs, after feeling tired in the first 20 miles from a lot of running in the past few weeks, all of a sudden felt light and my turnover was solid. My quads were in great shape. It was time to run. So in the last 10 miles, I was able to gain a lot of ground and even passed a runner about a 1/3 of the way from the finish line, crossing feeling quite fresh. Zero stomach problems. I continue to wonder at the effects of my sharp reduction in sugar, which I began earlier this year. Today, all feels good--just some minor soreness in my hips and ankles but otherwise the ship is sturdy. I put in an easy 7-miler this morning, followed by weights and my fifth sauna session. I'm looking to put in 10-12 total sauna sessions. Not really interested in any bank robber suit runs, though I admire the commitment quite a bit. The taper plan is to cut mileage by about 35% each week going into Western States, with very little the week of the race as I super-hydrate. I've been running ultras for 13 years and it's not every day that you can go into a race feeling solidly good about your training. I feel like this has been a hell of training cycle and so I can line up at Western States feeling confident that I can finish and ideally go sub-24 hours...or much better. My quads are there and the heat training is progressing. The word that best describes this whole process--from start to race day--is simple: Gratitude. I am grateful for this opportunity. With the Western States 100-Mile Endurance Run now 10 weeks away, my training has been so-so. I have been consistently getting in 70+ mile weeks over the past few months. As we know, consistency is one of the keys to fitness. Unfortunately, demands on my time--on the home front and at work--have made it very hard to get in much beyond 70-74 miles a week. We all have to make choices with our time. I had planned on getting my mileage up to 80+ miles a week in April and that may still happen by month's end (this week could actually hold some promise). But as of now there have been no 80-mile weeks--just a bunch of 70s. I guess it could be worse--70 miles a week isn't bad. Also, the weather has created challenges, which is to be expected in Colorado in the spring when it's 70 degrees one day and then dumping snow the next. There have been bright spots. Two weeks ago, I managed to get to Mount Falcon for a quality 3-hour run. The trails were in great shape and it was a fun morning on the mountain. But then more snow blew in this past weekend, covering the trails with a few feet of the white stuff. The snow over the weekend was, in fact, so severe that the 50K I had planned to race on Saturday--the Rattler in Colorado Springs--got canceled. This time of year, when you're a trail runner living in Colorado, you take what you can get. You run trails when they're clear and you run roads when spring snow storms come in and blanket the area. It is what it is. But it's kind of frustrating at times because I know what I need to do to be ready for Western States (lots of trail running with aggressive downhills) and the weather is making all of this quite difficult. That said, I feel pretty confident that May and early June will offer some opportunities to really take advantage of the trails and maybe even get in a Pikes Peak ascent/descent (which will be a great quad trasher). Anyway, with the Rattler canceled, I decided to enter the North Fork 50K on June 4. That's exactly three weeks before Western States. 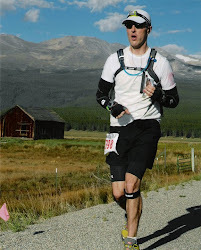 In 2014, I managed a solid North Fork, finishing fourth overall in the buildup to Leadville. This year, in lieu of racing it, I'll be using North Fork as one last long run. I'll be running it at "100-mile pace" and will keep my heart rate at or below MAF (~133-143). There will, of course, be times when my HR creeps up a little higher than that, especially on the climbs, but the overall goals will be to run North Fork at MAF, focus on good nutrition practices and then go immediately into my taper. It's a notoriously hot race, which is a good thing because, as we know, Western States gets quite balmy in the canyons. As far as Western States strategy, it's really pretty straightforward. In the first third, the key will be to run conservatively. Above all, do not go out too fast and race up the mountain with reckless abandon. Instead, go out easy and don't look at the watch. I'm not sure what the snow conditions will be but if there's a lot of snow--again--I'll focus on conserving energy and staying upright. When the heat kicks in, especially in the canyons, the key will be to stay hydrated and use every opportunity to cool myself. I'm planning to have a third bottle on hand that I'll use to douse myself with stream water. Above all else, I think staying as cool as possible (physically and mentally) at Western States is of utmost importance. I feel that I learned a lot about cooling myself at Javelina in 2015. That aside, with the steep ups and downs in the canyons, I'll just do my thing and put one foot in front of the other and try to enjoy the experience. Western States is a dream come true! In the last third of the race, where there's a lot of downhill, I really want to have the quads to take advantage of the descents. In order to have the quads ready for this stretch, I need to train as much as I can in the mountains, and that's why I'm feeling some urgency for the trails to stay open and not keep getting covered with snow! I want to stretch it out and run the last third of Western States. I know I have the ability to cover the last third of a 100 in a pretty quick fashion and so it's vital that the quads still be in good shape when I leave Foresthill (mile 62). 2) Sub 24 hours - really want that silver buckle! 3) Every man for himself! After Western States, the name of the game will be recovering in time for Leadville 56 days later. This will involve some limited running, some cross-training and some hiking up in the mountains--but nothing strenuous.